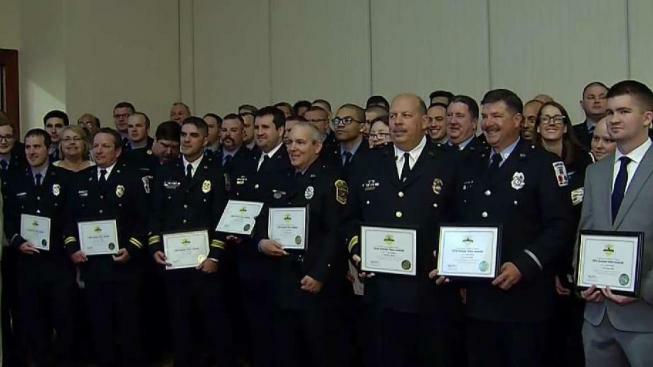 The first-responders who helped save members of a family after a food truck ran a stop sign and crashed into their car received valor awards in Loudoun County Friday. "I'm a really grateful person and this gives me the opportunity to actually shake people's hands, look them in the eye and say thank you for what they've done," said Faran Kaplan, father of three children who survived the crash." "I'm honored," paramedic Matthew Sheehan said. "I didn't go into this profession thinking that I would be recognized." Driving a red, converted school bus for his company Dane's Great American Hamburger, Tony Steven Dane ran a stop sign on Evergreen Mills Road in Leesburg, Virginia, about 4:50 p.m. Sept. 8, police said. The food truck slammed into a Audi station wagon carrying 39-year-old Erin Kaplan, her teenage son, Ben, her two daughters, and her mother, Jeanne Lester. 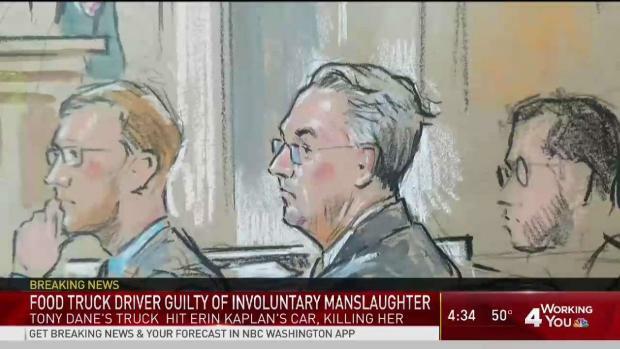 The food truck driver who crashed into a car in Northern Virginia and killed a woman was convicted on Friday of involuntary manslaughter. News4's Aimee Cho reports live just after the verdict came down. "It's so overwhelming to actually see the amount of first-responders that were there to help myself and my grandchildren and my daughter," Lester said. Erin Kaplan, who was at the wheel, was killed instantly, but first-responders helped Ben make it out alive. "I'm speechless," Faran Kaplan said. "I mean it's difficult for me to put words together to say how lucky I am to have all of my kids." "Having lost a parent as a child when I was 7 and just seeing the family go through what I went through further exacerbates the emotion involved with the incident," Sheehan said. 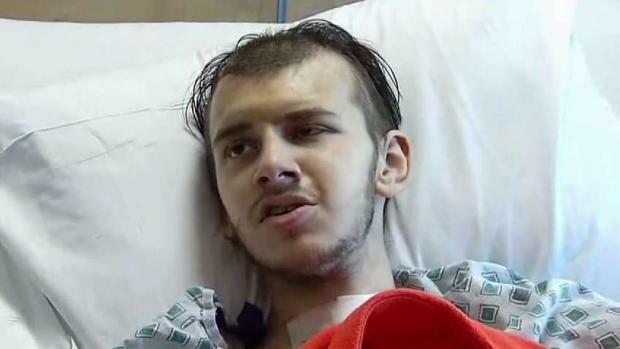 Ben Kaplan spent 54 days in a hospital and then was moved to a rehabilitation facility. His sisters and grandmother had brief hospital stays. A jury convicted Dane on five counts, including involuntary manslaughter. A Virginia teenager critically injured in a crash that killed his mother says his heart is broken but his body his mending. Northern Virginia Bureau Chief Julie Carey reports.